Over 250 peer-reviewed papers and other articles have been published from the PAP time-series since 1975. Dornelas et al., 2018. BioTIME: a database of biodiversity time series for the Anthropocene. Global Ecology and Biogeography 27:760-786 doi:doi.org/10.1111/geb.12729. Stefanoudis, P., R. Schiebel, R. Mallet, J. Durden, B. Bett and A. Gooday (2016) Agglutination of benthic forminifera in relation to mesoscale bathymetric features in the abyssal NE Atlantic (Porcupine Abyssal Plain). Marine Micropaleontology 123:15–28 (http://doi.org/10.1016/j.marmicro.2015.12.005). Stefanoudis, Paris V., Brian J. Bett and Andrew J. Gooday (2016) Abyssal hills: Influence of topography on benthic foraminiferal assemblages. Progress in Oceanography 148:44–55 (http://doi.org/10.1016/j.pocean.2016.09.005). Durden, Jennifer M., Brian J. Bett, Tammy Horton, Amanda Serpell-Stevens, Kirsty J. Morris, David S.M. Billett and Henry A. Ruhl (2016) Improving the estimation of deep-sea megabenthos biomass: dimension to wet weight conversions for abyssal invertebrates. Marine Ecology Progress Series, 552:71–79 (http://doi.org/10.3354/meps11769). Durden, Jennifer M., Brian J. Bett, Timm Schoening, Kirsty J. Morris, Tim W. Nattkemper and Henry A. Ruhl (2016) Comparison of image annotation data generated by multiple investigators for benthic ecology. Marine Ecology Progress Series, 552:61–70 (http://doi.org/10.3354/meps11775). Stephanoudis, P.V. and A.J. Gooday (2016) Formation of agglutinated cysts by the foraminiferan Sphaeroidina bulloides on the Porcupine Abyssal Plain (NE Atlantic). Marine Biodiversity, 46:747–749. (http://doi.org/10.1007/s12526-015-0433-6). Milligan, R., K. Morris, B. Bett, J. Durden, D. Jones, K. Robert, H. Ruhl and D. Bailey (2016) High resolution study of the spatial distributions of abyssal fishes by autonomous underwater vehicle. Scientific Reports, 6:26095 (http://doi.org/10.1038/srep26095). Morris, Kirsty J., Brian J. Bett, Jennifer M. Durden, Noelie M.A. Benoist, Veerle A.I. Huvenne, Daniel O.B. Jones, Katleen Robert, Matteo C. Ichino, George A. Wolff and Henry A. Ruhl (2016) Landscape-scale spatial heterogeneity in phytodetrital cover and megafauna biomass in the abyss links to modest topographic variation. Scientific Reports, 6:34080 (http://doi.org/10.1038/srep34080). Belcher, Anna, M. Iversen, S. Giering, V. Riou, S.A. Henson, L. Berline, L. Guilloux and R. Sanders (2016) Depth-resolved particle-associated microbial respiration in the northeast Atlantic. Orcid Biogeosciences, 13(17):4927–4943 (http://doi.org/10.5194/bg-13-4927-2016). Best, Mairi M.R., Paolo Favali, Laura Beranzoli, Jérôme Blandin, Namik M. Çağatay, Mathilde Cannat, Juan José Dañobeitia, Eric Delory, Jorge M.A. de Miranda, Joaquin Del Rio Fernandez, Henko de Stigter, Mick Gillooly, Fiona Grant, Per O.J. Hall, Susan Hartman, Joaquin Hernandez-Brito, Nadine Lanteri, Juergen Mienert, Gheorge Oaie, Jaume Piera, Vlad Radulescu, Jean-Francois Rolin, Henry A. Ruhl and Christoph Waldmann (2016) The EMSO-ERIC Pan-European Consortium: Data Benefits and Lessons Learned as the Legal Entity Forms, EMSO Consortium. Marine Technology Society Journal. 50(3):8–15 (http://doi.org/10.4031/MTSJ.50.3.13). Duffy, G., Z. Gutteridge, T. Horton and M. Thurston (2015) Population structure of Paralicella caperesca (Amphipoda: Lysianassoidea), a scavenging amphipod from the submarine canyons. Journal of the Marine Biological Association of the United Kingdom, 96(8):1687–1699 (http://doi.org/10.1017/S0025315415002064). Durden, Jennifer M., Brian J. Bett and Henry A. Ruhl (2015) The hemisessile lifestyle and feeding strategies of Iosactis vagabunda (Actiniaria, Iosactiidae), a dominant megafaunal species of the Porcupine Abyssal Plain. Deep-sea Research Part 1 – Oceanographic Research Papers, 102:72–77 (http://doi.org/10.1016/j.dsr.2015.04.010). Durden, Jennifer M., Brian J. Bett, Daniel O.B. Jones, Veerle A.I. Huvenne and Henry A. Ruhl (2015) Abyssal hills – hidden source of increased habitat heterogeneity, benthic megafaunal biomass and diversity in the deep sea. Progress in Oceanography Part 1, 137:209–218 (http://doi.org/10.1016/j.pocean.2015.06.006). Frigstad, H., S.A. Henson, S.E. Hartman, A.M. Omar1, E. Jeansson, H. Cole, C. Pebody and R.S. Lampitt (2015) Links between surface productivity and deep ocean particle flux at the Porcupine Abyssal Plain sustained observatory. Biogeosciences, 12(19):5885–5897 (http://doi.org/10.5194/bg-12-5885-2015). Hartman, S.E., Z.-P. Jiang, D. Turk, R.S. Lampitt, H. Frigstad, C. Ostle and U. Schuster (2015) Biogeochemical variations at the Porcupine Abyssal Plain sustained Observatory in the northeast Atlantic Ocean, from weekly to inter-annual timescales. Biogeosciences 12(3):845–853 (http://doi.org/10.5194/bg-12-845-2015). Hemsley, Victoria S., Timothy J. Smyth, Adrian P. Martin, Eleanor Frajka-Williams, Andrew F. Thompson, Gillian Damerell and Stuart C. Painter (2015) Estimating oceanic primary production using vertical irradiance and chlorophyll profiles from ocean gliders in the North Atlantic. Environmental Science and Technology, 49(19):11612–11621 (http://doi.org/10.1021/acs.est.5b00608). Horton, Tammy and Michael H. Thurston (2015) A revision of the genus Paracallisoma Chevreux, 1903 (Crustacea: Amphipoda: Scopelocheiridae: Paracallisominae) with a redescription of the type species of the genus Paracallisoma and the description of two new genera and two new species from the Atlantic Ocean. Zootaxa, 3995(1):91–132 (http://doi.org/10.11646/zootaxa.3995.1.12). Marsay, Chris M., Richard J. Sanders, Stephanie A. Henson, et al. (2015) Attenuation of sinking particulate organic carbon flux through the mesopelagic ocean. Proceedings of the National Academy of Sciences of the United States of America, 112(4):1089–1094 (http://doi.org/10.1073/pnas.1415311112). Rumyantseva, Anna, Natasha Lucas, Tom Rippeth, Adrian Martin, Stuart C. Painter, Timothy J. Boyd and Stephanie Henson (2015) Ocean nutrient pathways associated with passage of a storm. Global Biogeochemical Cycles, 29(8):1179–1189 (http://doi.org/10.1002/2015GB005097). Stefanoudis, P.V. and A.J. Gooday (2015) Basal monothalamous and pseudochambered benthic foraminifera associated with planktonic foraminiferal shells and mineral grains from the Porcupine Abyssal Plain, NE Atlantic. Marine Biodiversity, 45(3):357–369 (http://doi.org/10.1007/s12526-014-0277-5). Kirsty J. Morris, Brian J. Bett, Jennifer M. Durden, Veerle A.I. Huvenne, Rosanna Milligan, Daniel O.B. Jones, Stephen McPhail, Katleen Robert, David M. Bailey and Henry A. Ruhl (2014) A new method for ecological surveying of the abyss using autonomous underwater vehicle photography. Oceanography and Limnology: Methods, 12(11):795–809 (http://doi.org/10.4319/lom.2014.12.795). Marsay, Chris M., Richard J. Sanders, Stephanie A. Henson, Katsiaryna Pabortsavaa, Eric P. Achterberg and Richard S. Lampitt (2014) Attenuation of sinking particulate organic carbon flux through the mesopelagic. Proceedings of the National Academy of Sciences, 112(4)1089–1094 (http://doi.org/10.1073/pnas.1415311112). Sanders, Richard, Stephanie A. Henson, Marja Koski, Christina L. De la Rocha, Stuart C. Painter, Alex J. Poulton, Jennifer Riley, Baris Salihoglu, Andre Visser, Andrew Yool, Richard Bellerby and Adrian Martin (2014) The Biological Carbon Pump in the North Atlantic. Progress In Oceanography, 129(B):200–218 (http://doi.org/10.1016/j.pocean.2014.05.005). Marcinko, Charlotte L.J., Adrian P. Martin, and John T. Allen (2014) Modelling dinoflagellates as an approach to the seasonal forecasting of bioluminescence in the North Atlantic. Journal of Marine Systems, 139:261–276 (http://doi.org/10.1016/j.jmarsys.2014.06.014). Villa-Alfageme, M., F. de Soto, F.A.C. Le Moigne, S.L.C. Giering, R. Sanders and R. García-Tenorio (2014) Observations and modeling of slow-sinking particles in the twilight zone. Global Biogeochemical Cycles, 28(11):1327–1342 (http://doi.org/10.1002/2014GB004981). Le Moigne, Frédéric A.C., Katsiaryna Pabortsava, Charlotte L.J. Marcinko, Patrick Martin and Richard J. Sanders (2014) Where is mineral ballast important for surface export of particulate organic carbon in the ocean? Geophysical Research Letters 41(23):8460–8468 (http://doi.org/10.1002/2014GL061678). Stefanoudis, Paris V. and Andrew J. Gooday (2014) Basal monothalamous and pseudochambered benthic foraminifera associated with planktonic foraminiferal shells and mineral grains from the Porcupine Abyssal Plain, NE Atlantic. Marine Biodiversity (http://doi.org/10.1007/s12526-014-0277-5). Wagstaff, M.C., K.L. Howell, B.J. Bett, D.S.M. Billett, S. Brault, C.T. Stuart and M.A. Rex (2014) β-diversity of deep-sea holothurians and asteroids along a bathymetric gradient (NE Atlantic). Marine Ecology Progress Series, 508:177–185 (http://doi.org/10.3354/meps10877). Kazanidis, Georgios, Paul A. Tyler and David S.M. Billett (2014) On the reproduction of the simultaneous hermaphrodite Paroriza prouhoi (Holothuroidea: Synallactidae) in the Porcupine Abyssal Plain, north-east Atlantic. Journal of the Marine Biological Association of the United Kingdom, 94(4):847–856 (http://doi.org/10.1017/S0025315413001537). Ruhl, H.A., B.J. Bett, S.J.M. Hughes, Claudia H.S. Alt, E.J. Ross, R.S. Lampitt, C.A. Pebody, K.L. Smith and Billett D.S.M. (2014) Links between deep-sea respiration and community dynamics. Ecology, 95(6):1651–1662 (http://doi.org/10.1890/13-0675.1). Horton, Tammy and Michael H. Thurston (2014) A revision of the bathyal and abyssal necrophage genus Cyclocaris Stebbing, 1888 (Crustacea: Amphipoda: Cyclocaridae) with the addition of two new species from the Atlantic Ocean. Zootaxa, 3796(3):507–527 (http://doi.org/10.11646/zootaxa.3796.3.6). Torres Valdés, S., S.C. Painter, A.P. Martin, R. Sanders and J. Felden (2014) Data compilation of fluxes of sedimenting material from sediment traps in the Atlantic Ocean. Earth System Science Data, 6(1):1237–145 (http://doi.org/10.5194/essd-6-123-2014). Giering, Sarah L.C., Richard Sanders, Richard S. Lampitt, Thomas R. Anderson, Christian Tamburini, Mehdi Boutrif, Mikhail V. Zubkov, Chris M. Marsay, Stephanie A. Henson, Kevin Saw, Kathryn Cook and Daniel J. Mayor (2014) Reconciliation of the carbon budget in the ocean’s twilight zone. Nature, 507:480–483 (http://doi.org/10.1038/nature13123). Corrigan, Laura J., Tammy Horton, Heather Fotherby, Thomas A. White and A. Rus Hoelzel (2014) Adaptive Evolution of Deep-Sea Amphipods from the Superfamily Lysiassanoidea in the North Atlantic. Evolutionary Biology, 41(1):154–165 (http://doi.org/10.1007/s11692-013-9255-2). Laguionie-Marchais, C., D.S.M. Billett, G.L.D. Paterson, H.A. Ruhl, E.H. Soto, K.L. Smith Jr. and S. Thatje (2013) Inter-annual dynamics of abyssal polychaete communities in the North East Pacific and North East Atlantic – A family-level study. Deep Sea Research Part I: Oceanographic Research Papers, 75:175–186 (http://doi.org/10.1016/j.dsr.2012.12.007). Marcinko, Charlotte L.J., John T. Allen, Alex J. Poulton, Stuart C. Painter and Adrian P. Martin (2013) Diurnal variations of dinoflagellate bioluminescence within the open-ocean north-east Atlantic. Journal of Plankton Research, 35(1):177–190 (http://doi.org/10.1093/plankt/fbs081). Le Moigne, F.A.C., M. Villa-Alfageme, R.J. Sanders, C. Marsay, S. Henson and R. García-Tenorio (2013) Export of organic carbon and biominerals derived from Th-234 and Po-210 at the Porcupine Abyssal Plain. Deep Sea Research Part I: Oceanographic Research Papers, 72:88–101 (http://doi.org/10.1016/j.dsr.2012.10.010). Angel, Martin V. (2013) Planktonic ostracods (Myodocopa: Halocyprididae) from abyssopelagic depths in the Atlantic, North Pacific and Gulf of Oman: Chavturia abyssopelagica (n. gen., n. sp. ), Halocypretta profunda (n. sp. ), Halocypretta parvirostrata Chavtur and Stovbun, 2008 and Halocypretta striata (Müller, 1906). Zootaxa, 3709(5):401–431 (http://doi.org/10.11646/zootaxa.3709.5.1). Le Moigne, F.A.C., S.A. Henson, R.J. Sanders and E. Madsen (2013) Global database of surface ocean particulate organic carbon export fluxes diagnosed from the 234Th technique. Earth System Science Data, 5(2):295–304 (http://doi.org/10.5194/essd-5-295-2013). Baker, Maria, Eva Ramirez-Llodra and David Billett (eds.) (2013) Deep-Sea Biodiversity and Life History Processes (special issue). Deep Sea Research Part II: Topical Studies in Oceanography, 92:1–260 (Preface: http://doi.org/10.1016/j.dsr2.2013.03.040). Stal, Lucas J., Johan Decelle, Patrick Martin, Katsiaryna Paborstava, David W. Pond, Geraint Tarling, Frédéric Mahé, Colomban de Vargas, Richard Lampitt and Fabrice Not (2013) Diversity, Ecology and Biogeochemistry of Cyst-Forming Acantharia (Radiolaria) in the Oceans. PLoS ONE, 8(1):e53598 (http://doi.org/10.1371/journal.pone.0053598). Henson, Stephanie, Richard Lampitt and David Johns (2012) Variability in phytoplankton community structure in response to the North Atlantic Oscillation and implications for organic carbon flux. Limnology and Oceanography, 57(60):1591–1601 (http://doi.org/10.4319/lo.2012.57.6.1591). Hartman, Susan E., Richard S. Lampitt, Kate E. Larkin, Maureen Pagnani, Jon Campbell, Thanos Gkritzalis, Zong-Pei Jiang, Corinne A. Pebody, Henry A. Ruhl, Andrew J. Gooday, Brian J. Bett, David S. M. Billett, Paul Provost, Rob McLachlan, Jon D. Turton and Steven Lankester (2012) The Porcupine Abyssal Plain fixed-point sustained observatory (PAP-SO): variations and trends from the Northeast Atlantic fixed-point time-series. ICES Journal of Marine Science, 69(5):776–783 (http://doi.org/10.1093/icesjms/fss077). Riley, J.S., R. Sanders, C. Marsay, F.A.C. Le Moigne, E.P. Achterberg, and A.J. Poulton (2012) The relative contribution of fast and slow sinking particles to ocean carbon export. Global Biogeochemical Cycles, 26:GB1026 (http://doi.org/10.1029/2011GB004085). Lopez-Gonzalez, Pablo J. and Gary C. Williams, Gary C. (2011) A new deep-sea pennatulacean (Anthozoa: Octocorallia: Chunellidae) from the Porcupine Abyssal Plain (NE Atlantic). Helgoland Marine Research, 65(3):309–318 (http://doi.org/10.1007/s10152-010-0224-1). Hughes, Sarah Jane Murty, Henry A. Ruhl, Lawrence E. Hawkins, Chris Hauton, Ben Boorman and David S.M. Billett (2011) Deep-sea echinoderm oxygen consumption rates and an interclass comparison of metabolic rates in Asteroidea, Crinoidea, Echinoidea, Holothuroidea and Ophiuroidea. Journal of Experimental Biology, 214:2512–2521 (http://doi.org/10.1242/jeb.055954). Salter, I., A.E.S. Kemp, R.S. Lampitt and M. Gledhill (2010) The association between biogenic and inorganic minerals and the amino acid composition of settling particles. Limnology and Oceanography, 55(5):2207–2218 (http://doi.org/10.4319/lo.2010.55.5.2207). Painter, Stuart C., Rosalind E. Pidcock and John T. Allen (2010) A mesoscale eddy driving spatial and temporal heterogeneity in the productivity of the euphotic zone of the northeast Atlantic. Deep Sea Research Part II: Topical Studies in Oceanography, 57(15):1281–1292 (http://doi.org/10.1016/j.dsr2.2010.01.005). Martin, Adrian P., Michael I. Lucas, Stuart C. Painter, Rosalind Pidcock, Hartmut Prandke, Holger Prandke and Mark C. Stinchcombe (2010) The supply of nutrients due to vertical turbulent mixing: A study at the Porcupine Abyssal Plain study site in the northeast Atlantic. Deep Sea Research Part II: Topical Studies in Oceanography, 57(15):1293–1302 (http://doi.org/10.1016/j.dsr2.2010.01.006). Hartman, S.E., K.E. Larkin, R.S. Lampitt, M. Lankhorst and D.J. Hydes (2010) Seasonal and inter-annual biogeochemical variations in the Porcupine Abyssal Plain 2003–2005 associated with winter mixing and surface circulation. Deep Sea Research Part II: Topical Studies in Oceanography, 57(15):1303–1312 (http://doi.org/10.1016/j.dsr2.2010.01.007). Painter, Stuart C., Michael I. Lucas, Mark C. Stinchcombe, Thomas S. Bibby and Alex J. Poulton (2010) Summertime trends in pelagic biogeochemistry at the Porcupine Abyssal Plain study site in the northeast Atlantic. Deep Sea Research Part II: Topical Studies in Oceanography, 57(15):1313–1323 (http://doi.org/10.1016/j.dsr2.2010.01.008). Smythe-Wright, Denise, Stephen Boswell, Young-Nam Kim and Alan Kemp (2010) Spatio-temporal changes in the distribution of phytopigments and phytoplanktonic groups at the Porcupine Abyssal Plain (PAP) site. Deep Sea Research Part II: Topical Studies in Oceanography, 57(15):1324–1335 (http://doi.org/10.1016/j.dsr2.2010.01.009). Martin, Adrian P., Mikhail V. Zubkov, Ross J. Holland, Glen Tarran and Peter Burkill (2010) Variability in ultraplankton at the Porcupine Abyssal Plain study site. Deep Sea Research Part II: Topical Studies in Oceanography 57(15):1336–1345 (http://doi.org/10.1016/j.dsr2.2010.01.010). Lampitt, R.S., I. Salter, B.A. de Cuevas, S. Hartman, K.E. Larkin and C.A. Pebody (2010) Long-term variability of downward particle flux in the deep northeast Atlantic: Causes and trends. Deep Sea Research Part II: Topical Studies in Oceanography, 57(15):1346–1361 (http://doi.org/10.1016/j.dsr2.2010.01.011). Gooday, A.J., M.G. Malzone, B.J. Bett and P.A. Lamont (2010) Decadal-scale changes in shallow-infaunal foraminiferal assemblages at the Porcupine Abyssal Plain, NE Atlantic. Deep Sea Research Part II: Topical Studies in Oceanography, 57(15):1362–1382(http://doi.org/10.1016/j.dsr2.2010.01.012). Kalogeropoulou, V., B.J. Bett, A.J. Gooday, N. Lampadariou, P. Martinez Arbizu and A. Vanreusel (2010) Temporal changes (1989–1999) in deep-sea metazoan meiofaunal assemblages on the Porcupine Abyssal Plain, NE Atlantic. Deep Sea Research Part II: Topical Studies in Oceanography, 57(15):1383–1395 (http://doi.org/10.1016/j.dsr2.2009.02.002). Soto, Eulogio H., Gordon L.J. Paterson, David S.M. Billett, Lawrence E. Hawkins, Joelle Galéron and Myriam Sibuet (2010) Temporal variability in polychaete assemblages of the abyssal NE Atlantic Ocean. Deep Sea Research Part II: Topical Studies in Oceanography, 57(15):1396–1405 (http://doi.org/10.1016/j.dsr2.2009.02.003). Billett, D.S.M., B.J. Bett, W.D.K. Reid, B. Boorman and I.G. Priede (2010) Long-term change in the abyssal NE Atlantic: The ‘Amperima Event’ revisited. Deep Sea Research Part II: Topical Studies in Oceanography, 57(15)1406–1417 (http://doi.org/10.1016/j.dsr2.2009.02.001). FitzGeorge-Balfour, Tania, David S.M. Billett, George A. Wolff, Anu Thompson and Paul A. Tyler (2010) Phytopigments as biomarkers of selectivity in abyssal holothurians; interspecific differences in response to a changing food supply. Deep Sea Research Part II: Topical Studies in Oceanography, 57(15):1418–1428 (http://doi.org/10.1016/j.dsr2.2010.01.013). Steinhoff, T., T. Friedrich, S.E. Hartman, A. Oschlies, D.W.R. Wallace and A. Koertzinger (2010) Estimating mixed layer nitrate in the North Atlantic Ocean. Biogeosciences 7(3):795–807 (http://doi.org/10.5194/bg-7-795-2010). Benitez-Villalobos, F. and J.P. Diaz-Martinez (2010) Reproductive patterns of the abyssal asteroid Styracaster elongatus from the NE Atlantic Ocean. Deep Sea Research Part I: Oceanographic Research Papers, 57(1):157–161 (http://doi.org/10.1016/j.dsr.2009.09.006). Christiansen, Bernd, Solveig I. Bühring, Olaf Pfannkuche and Horst Weikert (2010) The near-bottom plankton community at the Porcupine Abyssal Plain, NE-Atlantic: Structure and vertical distribution. Marine Biology Research 6(2):113–124 (http://doi.org/10.1080/17451000903150363). Priede, I.G., J.A. Godbold, N.J. King, M.A. Collins, D.M. Bailey and J.D.M. Gordon (2010) Deep-sea demersal fish species richness in the Porcupine Seabight, NE Atlantic Ocean: global and regional patterns. Marine Ecology – An Evolutionary Perspective 31(1):247-260 (http://doi.org/10.1111/j.1439-0485.2009.00330.x). Steinhoff, T., T. Friedrich, S.E. Hartman, A. Oschlies, D.W.R. Wallace and A. Körtzinger (2010) Estimating mixed layer nitrate in the North Atlantic Ocean. Biogeosciences, 7(3):795–807 (http://doi.org/10.5194/bg-7-795-2010). Bailey, D.M., M.A. Collins, J.D.M. Gordon, A.F. Zuur and I.G. Priede (2009) Long-term changes in deep-water fish populations in the North East Atlantic: deeper-reaching effect of fisheries? Proceedings of the Royal Society B: Biological Sciences, 276:1965–1969 (http://doi.org/10.1098/rspb.2009.0098). Hathorne, E.C., R.H. James and R.S. Lampitt (2009) Environmental versus biomineralization controls on the intratest variation in the trace element composition of the planktonic foraminifera G. inflata and G. scitula. Paleoceanography, 24:PA4204 (http://doi.org/10.1029/2009PA001742). Lampitt, R.S., I. Salter and D. Johns (2009) Radiolaria: Major exporters of organic carbon to the deep ocean. Global Biogeochemical Cycles, 23:GB1010 (http://doi.org/10.1029/2008GB003221). Leblanc, K., C.E. Hare, Y. Feng, G.M. Berg, G.R. DiTullio, A. Neeley, I. Benner, C. Sprengel, A. Beck, S.A. Sanudo-Wilhelmy, U. Passow, K. Klinck, J.M. Rowe, S.W. Wilhelm, C.W. Brown and D.A. Hutchins (2009) Distribution of calcifying and silicifying phytoplankton in relation to environmental and biogeochemical parameters during the late stages of the 2005 North East Atlantic Spring Bloom. Biogeosciences 6(10):2155–2179 (http://doi.org/10.5194/bg-6-2155-2009). Pusceddu, A., A. Dell'Anno, M. Fabianand R. Danovaro (2009) Quantity and bioavailability of sediment organic matter as signatures of benthic trophic status. Marine Ecology Progress Series, 375:41–52 (http://doi.org/10.3354/meps07735). Smith, KL., Jr, H.A. Ruhl, B.J. Bett, D.S.M. Billett, R.S. Lampitt and R.S. Kaufmann (2009) Climate and deep-sea communities. 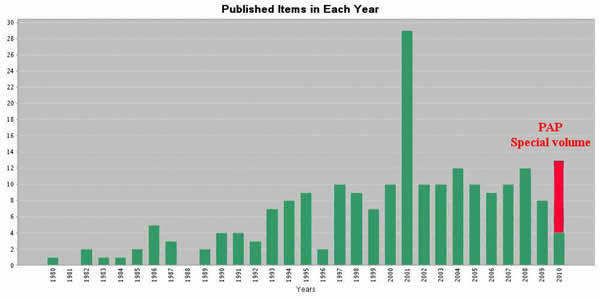 Proceedings of the National Academy of Sciences, USA, 106(46):19211–19218 (http://doi.org/10.1073/pnas.0908322106). Soetaert, K. and D. van Oevelen (2009) Modeling Food Web Interactions in Benthic Deep-Sea Ecosystems – A Practical Guide. Oceanography, 22(1):128–143 (http://doi.org/10.5670/oceanog.2009.13). Stowasser, G., R. McAllen, G.J. Pierce, M.A. Collins, C.F. Moffat, I.G. Priede and D.W. Pond (2009) Trophic position of deep-sea fish – Assessment through fatty acid and stable isotope analyses. Deep–Sea Research Part I: Oceanographic Research Papers, 56(5):812–826 (http://doi.org/10.1016/j.dsr.2008.12.016). Allen, J.A. (2008) Bivalvia of the Deep Atlantic. Malacologia, 50(1):57–173 (http://doi.org/10.4002/0076-2997-50.1.57). Gallinari, M., O. Ragueneau, D.J. DeMaster, H. Hartnett, D. Rickert and C. Thomas (2008) Influence of seasonal phytodetritus deposition on biogenic silica dissolution in marine sediments – Potential effects on preservation. Deep Sea Research Part II: Topical Studies in Oceanography, 55(22–23):2451–2464 (http://doi.org/10.1016/j.dsr2.2008.06.005). King, N.J. and I.G. Priede (2008) Coryphaenoides armatus, the abyssal grenadier: distribution, abundance, and ecology as determined by baited landers. pp139-161 in: Grenadiers of the Worlds Oceans: Biology, Stock Assessment, and Fisheries. Alexei M. Orlov and Tomio Iwamoto (eds.). American Fisheries Society Symposium 63 (ISBN-13: 9781934874004). Körtzinger, A., U. Send, R.S. Lampitt, S. Hartman, D.W.R. Wallace, J. Karstensen, M.G. Villagarcia, O. Llinas and M.D. DeGrandpre (2008) The seasonal pCO2 cycle at 49°N/16.5°W in the northeastern Atlantic Ocean and what it tells us about biological productivity. Journal of Geophysical Research, 113:C04020 (http://doi.org/10.1029/2007JC004347). Lampitt, R.S., E.P. Achterberg, T.R. Anderson, J.A. Hughes, M.D. Iglesias-Rodriguez, B.A. Kelly-Gerreyn, M. Lucas, E.E. Popova, R. Sanders, J.G. Shepherd, D. Smythe-Wright and A. Yool (2008) Ocean fertilization: a potential means of geoengineering? Philosophical Transactions of the Royal Society A: Mathematical, Physical & Engineering Sciences, 366: 3919-3945 (http://doi.org/10.1098/rsta.2008.0139). Lampitt, R.S., B. Boorman, L. Brown, M. Lucas, I. Salter, R. Sanders, K. Saw, S. Seeyave, S.J. Thomalla and R. Turnewitsch (2008) Particle export from the euphotic zone: Estimates using a novel drifting sediment trap, Th-234 and new production. Deep Sea Research Part I: Oceanographic Research Papers, 55(11):1484–1502 (http://doi.org/10.1016/j.dsr.2008.07.002). Seifried, S. and P. Martínez Arbizu (2008) A new and exceptional species of Bradya Boeck, 1873 (Copepoda: Harpacticoida: Ectinosomatidae) from the abyssal plain of the Angola Basin and the variability of deep-sea. Harpacticoida. Zootaxa, 1866:303–322 (www.mapress.com/zootaxa/2008/f/zt01866p322.pdf). Smart, C.W. (2008) Abyssal NE Atlantic benthic foraminifera during the last 15 kyr: Relation to variations in seasonality of productivity. Marine Micropaleontology, 69(2):193–211 (http://doi.org/10.1016/j.marmicro.2008.07.007). Smith, C.R, F.C. De Leo, A.F. Bernardino, A.K. Sweetman and P. Martinez Arbizu (2008) Abyssal food limitation, ecosystem structure and climate change. Trends in Ecology and Evolution 23(9):518–528 (http://doi.org/10.1016/j.tree.2008.05.002). Turnewitsch, Robert, Jean-Louis Reyss, Jonas Nycander, Joanna J. Waniek and Richard S. Lampitt (2008) Internal tides and sediment dynamics in the deep sea-Evidence from radioactive Th-234/U-238 disequilibria. Deep Sea Research Part I: Oceanographic Research Papers, 55(12):1727–1747 (http://doi.org/10.1016/j.dsr.2008.07.008). Bailey, D.M., Wagner H-J., Jamieson, A.J., Ross, M. F., Priede, I.G. ; 2007. A taste of the deep-sea: The roles of gustatory and tactile searching behaviour in the grenadier ﬁsh Coryphaenoides armatus. Deep Sea Research I 54; 99-108pp. Brandt, A., De Broyer, C., De Mesel, I., et al. ; 2007. The biodiversity of the deep Southern Ocean benthos. Philosophical Transactions of the Royal Society B – Biological Sciences 362: 39-66pp. Gillibrand, E.J.V., Bagley, P., Jamieson, A., et al. ; 2007. Deep sea benthic bioluminescence at artificial food falls, 1,000-4,800 m depth, in the Porcupine Seabight and Abyssal Plain, North East Atlantic Ocean. Marine Biology 150: 1053-1060pp. Gillibrand, E.J.V., Jamieson, A.J., Bagley, P.M., et al. 2007. Seasonal development of a deep pelagic bioluminescent layer in the temperate NE Atlantic Ocean. Marine Ecology – Progress Series 341: 37-44pp. Hall, P.O.J., Brunnegard, J., Hulthe, G., et al. ; 2007. Dissolved organic matter in abyssal sediments: Core recovery artifacts. Limnology and Oceanography 52: 19-31pp. Heger, A., King, N., Wigham, B.D., Jamieson, A.J., Bagley, P.M., Allan, L., Pfannkuche, O., Priede, I.G. ; 2007. Benthic Bioluminescence in the bathyal North East Atlantic: Luminescent responses of Vargula norvegica (Ostracoda: Myodocopida) to predation by the deep water eel (Synaphobranchus kaupii). Marine Biology 151 (4): 1471-1478pp. DOI; 10.1007/s00227-006-0587-7. Sebastian, S., Raes, M., De Mesel,I., Vanreusel, A.; 2007. Comparison of the nematode fauna from the Weddell Sea Abyssal Plain with two North Atlantic abyssal sites. Deep-Sea Research II 54: 1727-1736pp. Wagner, H-J., Kemp, K., Mattheus, U., Priede, I.G. ; 2007. Rhythms at the bottom of the deep sea: Cyclic current flow changes and melatonin patterns in two species of demersal fish. Deep-Sea Research I 54:1944–1956pp. Biseswar, R.; 2006. Additions to the deep-sea echiuran (Echiura) fauna of the North-East Atlantic. Zoosystema 28: 853-864pp. Fabri, M.C., Galeron, J., Larour, M., et al. ; 2006. Combining the Biocean database for deep-sea benthic data with the online Ocean Biogeographic Information System. Marine Ecology Progress Series 316: 215-224pp. Gooday, A.J., Esteban, G.F., Clarke, K.J. ; 2006. Organic and siliceous protistan scales in north-east Atlantic abyssal sediments. Journal of the Marine Biological Association of the United Kingdom, 86(4), 679-688pp. Jamieson, A.J., Bailey, D.M., Wagner, H.J., et al. ; 2006. Behavioural responses to structures on the seafloor by the deep-sea fish Coryphaenoides armatus: Implications for the use of baited lander. Deep Sea Research Part I – Oceanographic Research Papers 53: 1157-1166pp. Kemp, K.M., Jamieson, A.J., Bagley, P.M., McGrath, H., Bailey, D.M., Collins, M.A., Priede, I.G. ; 2006. Consumption of large bathyal food fall, a six month study in the NE Atlantic. Marine Ecology-Progress Series 310: 65-76pp. Neto, R.R., Wolff, G.A., Billett, D.S.M., et al. ; 2006. The influence of changing food supply on the lipid biochemistry of deep-sea holothurians. Deep Sea Research Part I – Oceanographic Research Papers 53: 516-527pp. Olabarria, C. 2006. Faunal change and bathymetric diversity gradient in deep-sea prosobranchs from Northeastern Atlantic. Biodiversity and Conservation 15: 3685-3702pp. Priede, I.G., Froese, R., Bailey, D.M., Bergstad, O.A., Collins, M.A., Dyb, J.E., Henriques, C., Jones, E.G., King, N.; 2006. The absence of sharks from abyssal regions of the world's oceans. Proc. R. Soc. B 273: 1435-1441pp. Smith, Jr, K.L., Baldwin, R.J., Ruhl, H.A., Kahru, M., Mitchell, B.G., Kaufmann, R.S. ; 2006. Climate effect on food supply to depths greater than 4000 m in the northeast Pacific. Limnology and Oceanography 51: 166-176pp. Bailey, D.M., Genard, B., Collins, M.A., Rees, F., Unsworth, S.K., Battle, E.J.V., Bagley, P.M., Jamieson, A.J., Priede, I.G. ; 2005. High swimming and metabolic activity in the deep-sea eel Synaphobranchus kaupii revealed by integrated in situ and in vitro measurements. Physiological & Biochemical Zoology 78: 335-346pp. Biseswar, R.; 2005. Report on some deep-sea echiurans (Echiura) of the North-East Atlantic. Zoosystema 27: 37-46pp. Carney, R.S., 2005. Zonation of deep biota on continental margins. Oceanography & Marine Biology – An Annual Review Vol 43: 211pp. Casanova, J.P., De Jong, L.; 2005. A new North-East Atlantic species of Bacescomysis (Mysidacea, Crustacea) with original moth-like antennules. Journal of Natural History 39: 1839-1849pp. Collins, M.A., Bailey, D.M., Ruxton, G.D., Priede, I.G. ; 2005. Trends in body size across an environmental gradient: A differential response in scavenging and non-scavenging demersal deep-sea fish. Proc. R. Soc. B 272: 2051-2057pp. McAllen, R., Taylor, A., Freel, J.; 2005. Seasonal variation in the ionic and protein content of haemolymph from seven deep-sea decapod genera from the Northeast Atlantic Ocean. Deep Sea Research Part I – Oceanographic Research Papers 52: 2017-2028pp. Olabarria, C.; 2005. Patterns of bathymetric zonation of bivalves in the Porcupine Seabight and adjacent Abyssal plain, NE Atlantic Deep-Sea Research I 52: 15-31pp. Ramirez-Llodra, E., Reid, W.D.K., and Billett, D.S.M. ; 2005. Long-term changes in reproductive patterns of the holothurian Oneirophanta mutabilis from the Porcupine Abyssal Plain. Marine Biology 146, 683-693pp. Rex, M.A., McClain, C.R., Johnson, N.A., Etter, R.J., Allen, J.A., Bouchet, P., Warén, A.; 2005. A Source-Sink Hypothesis for Abyssal Biodiversity. Am Nat 165: 163-178pp. Smyth, T.J., Tilstone, G.H., Groom, S.B.;.2005. Integration of radiative transfer into satellite models of ocean primary production. Journal of Geophysical Research, 110: C10014, doi:10.1029/2004JC002784. Battle, E.J.V., Bagley, P.M., Priede, I.G. ; 2004. The first deep-sea observations of natural benthic bioluminescence using an in situ ISIT camera. Luminescence (Chichester) 19: 134. 13th International Symposium on Bioluminescence and Chemiluminescence August 02-06, 2004, Yokohama, Japan. Brunnegård, J., Grandel, S., Ståhl, H., Tengberg, A., Hall, P.O.J. ; 2004. Nitrogen cycling in deep-sea sediments of the Porcupine Abyssal Plain, NE Atlantic Progress. Oceanography 63: 159-181pp. Gage, J.D., Anderson, R.M., Tyler, P.A., et al. ; 2004. Growth, reproduction and possible recruitment variability in the abyssal brittle star Ophiocten hastatum (Ophiuroidea: Echinodermata) in the NE Atlantic Deep Sea Research Part I – Oceanographic Research Papers 51: 849-864pp. Gallagher J.M., Carton M.W., Eardly D.F., et al. ; 2004 Spatio-temporal variability and diversity of water column prokaryotic communities in the eastern North Atlantic FEMS Microbiol Ecol 47 (2): 249-262pp. Gooday, A.J., Hori, S., Todo, Y., Okamoto, T., Kitazato, H., Sabbatini, A; 2004. Soft-walled, monothalamous benthic foraminiferans in the Pacific, Indian and Atlantic Oceans: aspects of biodiversity and biogeography. Deep-Sea Research I: 51: 33-53pp. Gooday, A.J., Malzone, M.G. ; 2004 Hyperammina micaceus sp. nov.: a new foraminferan species (Protista) from the Porcupine Abyssal Plain, northeast Atlantic. Journal of Micropalaeontology, 23(2), 171-179pp. Howell, K.L., Billett, D.S.M., Tyler, P.A. ; et al. 2004. Feeding ecology of deep-sea seastars (Echinodermata:Asteroidea): a pigment biomarker approach. Marine Biology – Progress Series 266: 103-110pp. Hudson, I.R., Pond, D.W., Billett, D.S.M., et al. ; 2004. Temporal variations in fatty acid composition of deep-sea holothurians: evidence of bentho-pelagic coupling. Marine Ecology – Progress Series 281: 109-120pp. Ruhl, H.A., Smith Jr, K.L. ; 2004. Shifts in deep-sea community structure linked to climate and food supply. Science 305: 513-515pp. Solis-Marin, F.A., Billett, D.S.M., Rogers, A.D., Preston, J.; 2004. Mitochondrial DNA sequence evidence supporting the recognition of a new species of the deep-sea holothurian genus Pseudostichopus from the North Atlantic. Journal of the Marine Biological Association of the UK 84, 1077-1084pp. Ståhl, H., Tengberg, A., Brunnegård, J., Hall. P.O.J. ; 2004. Recycling and burial of organic carbon in sediments of the Porcupine Abyssal Plain, NE Atlantic Deep-Sea Research I 51: 777-791pp. Ståhl, H., Tengberg, A, Brunnegård, J., et al. ; 2004. Factors influencing organic carbon recycling and burial in Skagerrak sediments. Journal of Marine Research 62: 867-907pp. Aberle, N., Witte, U.; 2003. Deep-sea macrofauna exposed to a simulated sedimentation event in the abyssal NE Atlantic: in situ pulse-chase experiments using 13C-labelled phytodetritus. Mar Ecol Prog Ser Vol. 251: 37–47pp. Bailey, D.M., Bagley, P.M., Jamieson, A.J., Collins, A.M., Priede, I.G. ; 2003. In situ investigation of burst swimming and muscle performance in the deep sea fish Antimora rostrata. Journal of Experimental Marine Biology & Ecology. 286/6: 295-311pp. Bett, B.J. ; 2003. Time-lapse photography in the deep sea. Underwater Technology 25(3): 121-127pp. Collins, M.A. ; 2003. The genus Grimpoteuthis (Octopoda : Grimpoteuthidae) in the north-east Atlantic, with descriptions of three new species : Zoological Journal of the Linnean Society 139: 93-127pp. Wigham B.D., Tyler P.A., Billett D.S.M. ; 2003. Reproductive biology of the abyssal holothurian Amperima rosea: an opportunistic response to variable flux of surface derived organic matter? Journal of the Marine Biological Association of the United Kingdom 83(1): 175-188pp. Howell, K.L., Pond, D.W., Billett, D.S.M.,Tyler, P.A. ; 2003. Feeding ecology of deep-sea seastars (Echinodermata: Asteroidea): a fatty acid biomarker approach. Marine Ecology Progress Series, 255: 193-206pp. Hudson, I.R., Wigham, B.D., Billett, D.S.M., Tyler, P.A. ; 2003. Seasonality and selectivity in the feeding ecology and reproductive biology of deep-sea holothurians. Progress in Oceanography, 59(4): 381-408pp. Hudson, I. R., Wigham, B.D. and Tyler, P.A. ; 2003. The feeding behaviour of deep-sea holothurians based on in situ observations and experiments using a Remotely Operated Vehicle. Journal of Experimental Marine Biology and Ecology, 301(1): 75-91pp. Lambshead, P.J.D., Brown, C.J., Ferrero, T.J., Hawkins, L.E., Smith, C.R., Mitchell, N.J.; 2003. Biodiversity of nematode assemblages from the region of the Clarion-Clipperton Fracture Zone, an area of commercial mining interest. BMC Ecology 3:1-12pp. Levin, L.A., Gooday, A.J. ; 2003. The deep Atlantic Ocean. In, Tyler, P.A. (ed.) Ecosystems of the world, Vol. 28. Ecosystems of the deep oceans. Amsterdam, the Netherlands, Elsevier, 111-178pp. Vinogradov, G.M., Vereshchaka, A.L., Musaeva, E.L., et al. ; 2003. Vertical zooplankton distribution over the Porcupine Abyssal Plain (Northeast Atlantic) in the summer of 2002. Oceanology 43 (4): 512-523pp. Wigham, B.D., Hudson, I.R., Billett, D.S.M., Wolff, G.A. ; 2003. Is long-term change in the abyssal Northeast Atlantic driven by qualitative changes in export flux? Evidence from the selective feeding in deep-sea holothurians. Progress in Oceanography 59, 409-411pp. Wigham, B.D., Tyler, P.A., Billett, D.S.M. ; 2003. Reproductive biology of the abyssal holothurian Amperima rosea: an opportunistic response to variable flux in surface derived organic matter? Journal of the Marine Biological Association of the United Kingdom 83: 175-188pp. Witte, U., Wenzhöfer, F., Sommer, S., Boetius, A., Heinz, P., Aberle, N., Sand, M., Cremer, A., Abraham, W-R., Jørgensen, B.B., Pfannkuche, O.; 2003. In situ experimental evidence of the fate of a phytodetritus pulse at the abyssal sea floor. Nature 424, 763-766pp. Agueneau , O., Corrin. L., et al. ; 2002. The importance of water column processes on the dissolution properties of biogenic silica in deep-sea sediments I. Solubility Geochem Cosmochim AC 66 (15): 2701-2717pp. Bailey, D.M. , Jamieson, A.J., Bagley, P.M., Collins, M.A., Priede, I.G. ; 2002. Measurement of in situ oxygen consumption of deep-sea fish using an autonomous lander vehicle. Deep Sea Research Part I: Oceanographic Research , 49 (8): 1519-1529pp. Gooday, A.J. ; 2002. Organic-walled Allogromids: Aspects of their occurrence, diversity and ecology in marine habitats. The Journal of Foraminiferal Research 32: 384-399pp. Henriques, C., Priede, I.G., Bagley, P.M.; 2002. Baited camera observations of deep-sea demersal fishes of the northeast Atlantic Ocean at 15–28N off West Africa. Marine Biology 141: 307–314pp. Howell, K. L., Billett, D.S.M., Tyler, P.A. ; 2002. Depth-related distribution and abundance of seastars (Echinodermata: Asteroidea) in the Porcupine Seabight and Porcupine Abyssal Plain. N.E. Atlantic Deep-Sea Research I: 49: 1901-1920pp. Ramirez-Llodra, E., Tyler, P.A., Billett, D.S.M. ; 2002. Reproductive biology of porcellanasterid asteroids from three abyssal sites in the northeast Atlantic with contrasting food input .Marine Biology 140: 773–788pp. Siegel, D.A., Doney, S.C., Yoder, J.A. ; 2002. The North Atlantic spring phytoplankton bloom and Sverdrup’s critical depth hypothesis. Science, 296, 730-733pp. Wagner, H.J., Mattheus, U.; 2002. Pineal organs in deep demersal fish. Cell and Tissue Research 307: 115-127pp. Bett, B.J., Malzone, M.G., Narayanaswamy, B.E., Wigham, B.J. ; 2001. Temporal variability in phytodetritus and megabenthic activity at the seabed in the deep Northeast Atlantic. Progress in Oceanography 50, 349-368pp. Billett, D.S.M., Bett, B.J., Rice, A.L., Thurston, M.L., Galéron, J., Sibuet, M.,Wolff, G. A.; 2001. Long-term change in the megabenthos of the Porcupine Abyssal Plain (NE Atlantic). Progress in Oceanography 50, 325-348pp. Billett, D.S.M., Rice, A.L. ; 2001. The BENGAL Programme: introduction and overview. Progress in Oceanography 50, 13-25pp. Buehring, S.I., Christiansen, B.; 2001. Lipids in selected abyssal benthopelagic animals: links to the epipelagic zone? Progress in Oceanography 50 369-382pp. Collins M.A., Yau, C., Allcock L., et al. ; 2001. Distribution of deep-water benthic and bentho-pelagic cephalopods from the north-east Atlantic. J Mar Biol Assoc UK 81 (1): 105-117pp. Danovaro, R., Dell’Anno, A., Fabiano, M.; 2001. Bioavailability of organic matter in the sediments of the Porcupine Abyssal Plain, northeastern Atlantic. Mar. Ecol. Prog. Ser. 220: 25–32pp. Eardly, D.F., Carton, M.W., Gallagher, J.M., Patching, W.; 2001. Bacterial abundance and activity in deep-sea sediments from the eastern North Atlantic. Progress in Oceanography 50: 245-259pp. Fabiano, M., Pusceddu, A., Dell'Anno, A., et al; 2001. Fluxes of phytopigments and labile organic matter to the deep ocean in the NE Atlantic Ocean. Prog Oceangr 50 (1-4): 89-104pp Special Issue. Ginger, M., Billett, D.S.M., Mackenzie, K.L., Kiriakoulakis, K., Neto, R.R., Boardman, D.K., Santos, V.C.L.S., Horsfall, I.M., Wolff, G.A. ; 2001. Organic matter assimilation and selective feeding by holothurians in the deep sea: some observations and comments. Progress in Oceanography 50, 407-422pp. Glover, A., Paterson, G., Bett, B., Gage, J., Sibuet, M., Sheader, M., Hawkins, L.; 2001. Patterns in polychaete abundance and diversity from the Madeira Abyssal Plain, northeast Atlantic. Deep Sea Research I 48: 217-236pp. Gooday, A.J., Alve, E.; 2001. Morphological and ecological parallels between sublittoral and abyssal foraminiferal species in the NE Atlantic: a comparison of Stainforthia fusiformis and Stainforthia sp. Progress in Oceanography 50: 261-283pp. Iken, K., Brey, T., Wand, U., Voigt, J., Junghans, P. 2001. Food web structure of the benthic community at the Porcupine Abyssal Plain (NE Atlantic): a stable isotope analysis. Progress in Oceanography 50, 383-405pp. Kiriakoulakis, K., Stutt, E., Rowland, S.J., Vangriesheim, A., Lampitt, R.S., Wolff, G.A. ; 2001. Controls on the organic chemical composition of settling particles in the Northeast Atlantic Ocean. Progress in Oceanography 50, 65-87pp. Koeve, W.; 2001. Wintertime nutrients in the North Atlantic – New approaches and implications for estimates of seasonal new production. Marine Chemistry, 74, 245-260pp. Körtzinger, A., Koeve, W., Kähler, P., Mintrop, L.; 2001. C:N ratios in the mixed layer during the productive season in the Northeast Atlantic Ocean. Deep Sea Research I, 48, 3, 661-688pp. Lambshead, P.J.D., Tietjen, J., Glover, A., Ferrero, T., Thistle, D., Gooday, A.J. ; 2001. Impact of large-scale natural physical disturbance on the diversity of deep-sea North Atlantic nematodes. Marine Ecology Progress Series 214: 121-126pp. Lampitt, R.S., Bett, B.J., Kiriakoulis, K., Popova, E.E., Ragueneau, O., Vangriesheim, A., Wolff, G.A. ; 2001. Material supply to the abyssal seafloor in the Northeast Atlantic. Progress in Oceanography, 50, 27-63pp. Rabouille, C., Stahl, H., Bassinot, F., et al. ; 2001. Imbalance in the carbonate budget of surficial sediments in the North Atlantic Ocean: variations, over the last millenium? Progress in Oceanography 50: 201-221pp. Ragueneau O., Gallinari M., Corrin L., et al. ; 2001. The benthic silica cycle in the Northeast Atlantic: annual mass balance, seasonality, and importance of non-steady-state processes for the early diagenesis of biogenic opal in deep-sea sediments Prog Oceanogr 50 (1-4): 171-200pp. Special Issue. Sumida, P.Y.G., Tyler, P.A., Billett, D.S.M. ; 2001. Early juvenile development of deep-sea asteroids of the NE Atlantic Ocean, with notes on juvenile bathymetric distributions. Acta Zoologica 82:11-40pp. Turnewitsch, R., Springer, B.M. ; 2001. Do bottom mixed layers influence 234Th dynamics in the abyssal near-bottom water column? Deep-Sea Research I: 48: 1279-1307pp. Varnavas, S.P., Panagiotaras, D.,Wolff, G.A., 2001. Biogeochemical processes at the sediment–water interface in a Northeastern Atlantic abyssal locality (Porcupine Abyssal Plain) Progress in Oeanography 50: 223-243pp. Vangriesheim, A., Springer, B., Crassous, P.; 2001. Temporal variability of near-bottom particle resuspension and dynamics at the Porcupine Abyssal Plain, Northeast Atlantic. Progress in Oceanography 50: 123-145pp. Vanreusel, A., Cosson-Sarradin, N., Gooday, A.J., Paterson, G.L.J., Galéron, J., Sibuet, M., Vincx, M.; 2001. Evidence for episodic recruitment in a small opheliid polychaete species from the abyssal NE Atlantic. Progress in Oceanography 50: 285-301pp. van Weering T.C.E., De Stigter, H.C., Balzer, W., et al. ; 2001. Benthic dynamics and carbon fluxes on the NW European continental margin. Deep Sea Res Part II 48 (14-15): 3191-3221pp. Vanucci, S., Dell'Anno, A., Pusceddu, A., et al. ; 2001. Microbial assemblages associated with sinking particles in the Porcupine Abyssal Plain (NE Atlantic Ocean). Prog Oceanogr 50 (1-4): 105-121pp. Special Issue. Witbaard, R., Duineveld, G.C.A., Kok, A., van der Weele, J., Berghuis, E.M.; 2001. The response of Oneirophanta mutabilis (Holothuroidea) to the seasonal deposition of phytopigments at the Porcupine Abyssal Plain in the Northeast Atlantic. Progress in Oceanography 50: 423-441pp. Bagley, P.M., Bradley, S., Collins, M.A., Priede, I.G., Gray, P.; 2000. Miniature code activated transponder for tracking fish at abyssal depths using delay activation to overcome reverberation.. In "Advances in Fish Telemetry" Proceedings of the 3rd Conference on Fish Telemetry in Europe 1999 13-19pp. Cunningham, S.A.; 2000. Circulation and volume flux of the North Atlantic using synoptic hydrographic data in a Bernoulli inverse. J Mar Res 58 (1): 1-35pp. Dell'Anno, A., Fabiano, M., Mei, M.L., et al. ; 2000. Enzymatically hydrolysed protein and carbohydrate pools in deep-sea sediments: estimates of the potentially bioavailable fraction and methodological considerations. Mar Ecol – Progress Series 196: 15-23pp. Ginger, M., Santos, V.L.C.S., Wolff, G.A. ; 2000. A preliminary investigation of the lipids of abyssal holothurians from the north-east Atlantic Ocean. Journal of the Marine Biological Association of the United Kingdom 80, 139-146pp. Lampitt, R.S., Newton, P.P., Jickells, T.D., Thomson, J., King, P.; 2000. Near-bottom particle flux in the abyssal Northeast Atlantic. Deep Sea Research II, 47, 2051-2071pp. Priede, I.G. ; Bagley, P.M.; 2000. In situ studies on deep-sea demersal fishes using autonomous unmanned lander platforms. Oceanography & Marine Biology, Annual Review. 38: 357-392pp. Roberts, D., Gebruk, A., Levin, V., Manship, B.A.D. ; 2000. Feeding and digestive strategies in deposit-feeding holothurians. Oceanography and Marine Biology: an Annual review 38, 257-310pp. Trudeau, V.L., Bosma, P.T., Collins, M.A., Priede, I.G., Docherty, K.; 2000. Sexually dimorphic expression of glutamate decarboxylase mRNA in the hypothalamus of the deep sea armed grenadier, Coryphaenoides (Nematonurus) armatus. Brain Behavior & Evolution, 56: 269-275pp. van Aken, H.M.; 2000. The hydrography of the mid-latitude northeast Atlantic Ocean I: The deep water masses. Deep Sea Research Part I 47 (5): 757-788pp. Yau, C., Priede, I.G., Collins, M.A. ; 2000. Estimation of abundance of deep-sea fishes: telemetry and the problem of measuring swimming speed. "Advances in Fish Telemetry" Proceedings of the 3rd Conference on Fish Telemetry in Europe, 1999 159-164pp. Bagley, P.M., Bradley, S., Priede, I.G., Gray, P.; 1999. Measurements of fish movements at depths to 6000m using a deep-ocean lander incorporating a short base-line sonar utilizing miniature Code Activated Transponder technology. Measurement Science & Technology, 10: 1214-1221pp. Billett, D.S.M., Bett, B., Lampitt, R.; 1999. Long-term change in abyssal communities. Deep-Sea Newsletter 28: 7-8pp. Collins, M., Bagley, P.; 1999. Scavengers of the deep. Biologist (London) 46 54-56pp. Collins, M.A., Priede, I.G., Bagley, P.M.; 1999. In situ comparison of activity in two deep-sea scavenging fishes occupying different depth zones. P Roy Soc Lon B Bio 266 (1432): 2011-2016pp. Gooday, A.J., Rathburn, A.E. ; 1999. Temporal variability in living deep-sea benthic foraminifera: a review Earth Sci Rev 46 (1-4): 187-212pp. Special Issue. Smallwood, B.J., Wolff, G.A., Bett, B.J., et al. ; 1999. Megafauna can control the quality of organic matter in marine sediments. Nature Wissenschaften 86 (7): 320-324pp. Smith, K.L., Kaufmann, R.S. ; 1999. Long-term discrepancy between food supply and demand in the deep eastern North Pacific. Science 284, 1174-1177pp. Witte, U., 1999. Consumption of large carcasses by scavenger assemblages in the deep Arabian Sea: observations by baited camera. Mar Ecol Prog Ser 183: 139-147pp. Collins, M.A., Priede, I.G., Addison, S., et al. ; 1998. Acoustic tracking of the dispersal of organic matter by scavenging fishes in the deep-sea. Hydrobiologica 372: 181-186pp. Floch, J. Blain, S., Birot, D., Treguer, P.; 1998. In situ determination of silicic acid in sea water based on FIA and colorimetric dual-wavelength measurements. Analytica Chimica Acta 377: 157-166pp. Gooday, A.J., Bett, B.J., Shires, R., et al. ; 1998. Deep-sea benthic foraminiferal species diversity in the NE Atlantic and NW Arabian sea: a synthesis. Deep Sea Res Part II 45 (1-3): 165-201pp. Jones, E.G., Collins, M.A.,Bagley, P.M., Addison, S., Priede, I.G. ; 1998. The fate of cetacean carcasses in the deep sea: observations on consumption rates and succession of scavenging species in the abyssal north-east Atlantic Ocean. Proc Biol Sci. 265(1401): 1119–1127pp. Paterson, G.L.J., Wilson, G.D.F., Cosson, N., Lamont, P.A. ; 1998. Hessler and Jumars (1974) revisited: abyssal polychaete assemblages from the Atlantic and Pacific. Deep-Sea Research II 45: 225-251pp. Pfannkuche, O., Soltwedel, T.; 1998. Small benthic size classes along the N.W. European Continental Margin: spatial and temporal variability in activity and biomass. Progress in Oceanography 42: 189-207pp. Priede, I.G., Merrett, N.R. ; 1998. The relationship between numbers of fish attracted to baited cameras and population density: Studies on demersal grenadiers Coryphaenoides (Nematonurus) armatus in the abyssal NE Atlantic Ocean. Fisheries Research 36: 133-137pp. Smith, K.L., Druffel, E.R.M. ; 1998. Long time-series studies of the benthic boundary layer at an abyssal station in the northeast Pacific. Deep-Sea Research II 45, 573-586pp. Thurston, M.H., Rice, A.L., Bett, B.J. ; 1998. Latitudinal variation in invertebrate megafaunal abundance and biomass in the North Atlantic Ocean Abyss. Deep Sea Res Part II 45 (1-3): 203-224pp. Bronsdon, S.K., Rogers, A.D., Tyler, P.A, et al. ; 1997. Genetic study of the extent and consequences of sexual and asexual reproduction in the deep-sea epizoic anemones Amphianthus inornata and Kadosactis commensalis (Cnidaria: Anthozoa) Mar Biol 128 (2): 231-239pp. Gooday, A.J., Shires, R., Jones, A.R. ; 1997. Large, deep-sea agglutinated foraminifera: Two differing kinds of organization and their possible ecological significance. J Foramin Res 27 (4): 278-291pp. Horsfall, I.M., Wolff, G.A. ; 1997. Hydrolysable amino acids in sediments from the Porcupine Abyssal Plain, northeast Atlantic Ocean. Org Geochem 26 (5-6): 311-320pp. Lampitt, R.S., Antia, A.N. ; 1997. Particle flux in deep seas: regional characteristics and temporal variability. Deep-Sea Research Part I 44(8): 1377-1403pp. RiemannZurneck, K., Hemisessile, K.A. ; 1997. Sea anemone from the Porcupine Abyssal Plain, North Atlantic Ocean: Iosactis vagabunda gen nov, sp nov. J Mar Biol Assoc UK 77 (4): 1011-1025pp. Roberts, D., Moore, H.M; 1997. Tentacular diversity in deep-sea deposit-feeding holothurians: implications for biodiversity in the deep sea. Biodiversity and Conservation 6: 1487-1505pp. Smart, C.W., Gooday, A.J. ; 1997. Recent benthic foraminifera in the Abyssal northeast Atlantic Ocean: Relation to phytodetrital inputs. J Foramin Res 27 (2): 85-92pp. Smith, A., Matthiopoulos, J., Priede, I.G. ; 1997. Areal coverage of the ocean floor by the deep-sea elasipodid holothurian Oneirophanta mutabilis: Estimates using systematic, random and directional search strategy simulations. Deep Sea Res Part I 44 (3): 477pp. Smith, A.I.G., Priede, I.G., Bagley, P.M., and Addison S.W. ; 1997. Interception and dispersal of artificial food falls by scavenging fishes in the abyssal Northeast Atlantic: early-season observations prior to annual deposition of phytodetritus. Marine Biology 128: 329-33pp. Gooday, A.J. ; 1996. Epifaunal and shallow infaunal foraminiferal communities at three abyssal NE Atlantic sites subject to differing phytodetritus input regimes. Deep Sea Res Part I 43 (9): 1395-1421pp. Gooday, A.J. ; 1996. Xenophyophores (Protista), including two new species, from two abyssal sites in the Northeast Atlantic Ocean. J Foramin Res 3: 193-208pp. Boyd, P., Newton, P.; 1995. Evidence of the influence of planktonic community structure on the interannual variability of particulate flux during spring in the NE Atlantic. Deep-Sea Research, 42(5), 619-639pp. Gooday, A.J., Carstens, M., Thiel, H.; 1995. Microforaminifera and Nanoforaminifera from Abyssal Northeast Atlantic Sediments - A Preliminary-Report. Int Rev Ges Hydrobio 80 (2): 361-383pp. Lambshead, P.J.D., Ferrero, T.I., Wolff, G.A. ; 1995. Comparison of the Vertical-Distribution of Nematodes from 2 Contrasting Abyssal Sites in the Northeast Atlantic subject to different seasonal inputs of Phytodetritus. Int Rev Ges Hydrobio 80 (2): 327-331pp. Lampitt, R.S., Raine, R.C.T., Billett, D.S.M., Rice, A.L. ; 1995. Material supply to the European continental slope: A budget based on benthic oxygen demand and organic supply. Deep-Sea Research I, Vol. 42, 11/12, 1865-1880pp. Savidge, G., Boyd, P., Pomroy, A., Harbour, D., Joint, I.; 1995. Phytoplankton production and biomass estimates in the Northeast Atlantic-Ocean: May to June 1990. Deep-Sea Research Part I 42(5): 599-617pp. Soetaert, K., Heip C.; 1995. Nematode assemblages of deep-sea and shelf break sites in the North Atlantic and Mediterranean Sea. Mar Ecol Prog Ser 125: 171-183pp. Thurston, M.H., Bett, B. J., Rice, A.; 1995. Abyssal Megafaunal Necrophages - Latitudinal Differences in the Eastern North-Atlantic Ocean. Int Rev Ges Hydrobio 80 (2): 267-286pp. Tyler, P.A., Bronsdon, S.K., Young, C.M., et al. ; 1995. Ecology and Gametogenic Biology of the genus Umbellula (Pennnatulacae) in the North Atlantic Ocean. Internationale Revue Der Gesamten Hydrobiologie 80: 187-199pp. Vanreusel, A., Vincx, M., Bett, B. J., et al. ; 1995. Nematode Biomass Spectra at 2 Abyssal Sites in the NE Atlantic with a Contrasting Food-Supply. Int Rev Ges Hydrobio 80 (2): 287-296pp. Bagley, P.M., Smith, A., Priede, I.G. ; 1994. Tracking movements of deep demersal fishes in the Porcupine Seabight, north-east Atlantic Ocean. Journal of the Marine Biological Association of the United Kingdom 74: 473-480pp. Dauvin, J-C., Kendall, M., Paterson, G., Gentil, F., Jirkov, I., Sheader, M., de Lange, M.; 1994. An Initial Assessment of Polychaete Diversity in the Northeastern Atlantic. Ocean Biodiversity Letters 2: 171-181pp. Newton, P.P., Lampitt, R.S., Jickells, T.D., King, P., Boutle, C.; 1994. Temporal and spatial variability of biogenic particle fluxes during the JGOFS northeast Atlantic process studies at 47N 20W. Deep-Sea Research, 41, 1617-1642pp. Stoecker, D. K., Sieracki, M.E., Verity, P.G., Michaels, A.E., Haugen, E., Burkill, P.H., Edwards, E.S. ; 1994. Nanoplankton and protozoan microzooplankton during the JGOFS North-Atlantic Bloom Experiment - 1989 and 1990. Journal of the Marine Biological Association of the United Kingdom 74(2): 427-443pp. Rice A.L., Thurston, M.H., Bett, B.J. ; 1994. The Iosdl Deepseas Program - Introduction and Photographic Evidence for the Presence and Absence of a Seasonal Input of Phytodetritus at Contrasting Abyssal Sites in the Northeastern Atlantic. Deep-Sea Res Pt I 41 (9): 1305-1320pp. Santos, V., Billett, D.S.M., Rice A.L., et al; 1994. Organic-Matter in Deep-Sea Sediments from the Porcupine Abyssal-Plain in the Northeast Atlantic-Ocean .Lipids Deep-Sea Res Pt I 41 (5-6): 787-819pp. Shires, R., Gooday, A.J., Jones, A.R. ; 1994. A new large agglutinated foraminifer (Arboramminidae n. fam.) from an oligotrophic site in the abyssal Northeast Atlantic. Journal of Foraminiferal Research 24 149-157pp. Thurston, M.H., Bett, B.J., Rice, A.L., et al. ; 1994. Variations in the Invertebrate Abyssal Megafauna in the North-Atlantic Ocean. Deep-Sea Res Pt I 41 (9): 1321-1348pp. Vincx, M., Bett, B.J., Dinet, A. et al. ; 1994. Meiobenos of the Deep Northeast Atlantic. Advances in Marine Biology 30: 1-88pp. Bett, B.J., Rice, A.L. ; 1993. The Feeding-Behavior of an Abyssal Echiuran Revealed by In-Situ Time-Lapse Photography. Deep-Sea Res Pt I 40 (9): 1767-1779pp. Ducklow, H.W., Harris, R.P. ; 1993. Introduction to the JGOFS North Atlantic Bloom Experiment. Deep Sea Research Part II 40(1-2), 1-8pp. Garside, C., Garside, J.C., 1993. The f-ratio on 20°W during the North Atlantic Bloom Experiment. Deep Sea Research II, 40, 75-90pp. Gooday, A.J. ; 1993. Deep-Sea Benthic Foraminiferal Species which exploit Phytodetritus - Characteristic Features and Controls on Distribution. Mar Micropaleontol 22 (3): 187-205pp. Gooday, A.J., Bett, B.J., Pratt, D.N. ; 1993. Direct observation of episodic growth in an abyssal xenophyophore (Protista). Deep-Sea Research I: 40: 2131-2143pp. Honjo, S., Manganini, S.J. ; 1993. Annual biogenic particle fluxes to the interior of the North Atlantic Ocean, studied at 34N21W and 48N21W. Deep-Sea Research, 40, 587-607pp. Lampitt, R.S., Hillier, W.R., Challenor, P.G. ; 1993. Seasonal and Diel Variation in the Open Ocean Concentration of Marine Snow Aggregates. Nature 362: 737-739pp. Robinson, A., McGillicuddy, D.J., Calman, J., Ducklow, H.W., Fasham, M.J.R., Hoge, F.E., Leslie, W.G., McCarthy, J.J., Podewski, S., Porter, D.L., Saure, G., Yoder, J.A., 1993. Mesoscale and upper ocean variabilities during the 1989 JGOFS bloom study. Deep Sea Research II, 40, 9–35pp. Thomson, J., Colley, S., Anderson, R., et al. ; 1993. Holocene Sediment Fluxes in the Northeast Atlantic from Th-230(Excess) and Radiocarbon Measurements. Paleoceanography 8 (5): 631-650pp. Armstrong, J.D., Bagley, P.M., Priede, I.G. ; 1992. Photographic and Acoustic Tracking Observations of the Behaviour of the Grenadier Coryphaenoides (Nematonurus)-Armatus, the Eel Synaphobranchus-Bathybius, and Other Abyssal Demersal Fish in the North-Atlantic. Ocean Mar Biol 112 (4): 535-544pp. Tyler, P.A., Young, C.M., Billett, D.S.M., Giles, L.A.; 1992, Pairing behaviour, reproduction and diet in the deep-sea holothurian genus Paroriza (Holothurioidea: Synallactidae). Journal of the Marine Biological Association of the United Kingdom 72: 447-462pp. Billett, D.S.M. ; 1991. Deep-sea holothurians. Oceanography and Marine Biology, an Annual Review 29, 259-317pp. Bray, R.A., Gibson, D.I. ; 1991. The Lepocreadiidae (Digenea) of Fishes from the North-East Atlantic - Profundivermis-Intercalarius N-G, N-Sp from the Marine Fish Coryphaenoides (Nematonurus) Armatus (Hector) (Macrouridae) from The Porcupine Abyssal-Plain. Syst Parasitol 18 (2): 121-125pp. Rice, A.L., Billett, D.S.M., Thurston, M.H., Lampitt, R.S. ; 1991. The Institute of Oceanographic Sciences Biology Programme in the Porcupine Seabight; background and general introduction. Journal of the Marine Biological Association of the United Kingdom 71, 281-310pp. Gooday, A. J., Turley, C.M., Allen, J.A. ; 1990. Responses by Benthic Organisms to Inputs of Organic Material to the Ocean Floor: A Review. Philosophical Transactions of the Royal Society of London. Series A, Mathematical and Physical Sciences, Vol. 331, No. 1616, The Deep Sea Bed: Its Physics, Chemistry and Biology (Jun. 19,) 119-138pp. Tyler, P. A., Billett, D.S.M., Gage, J.D. ; 1990. Seasonal reproduction in the seastar Dytaster grandis from 4000m in the north-east Atlantic Ocean. Journal of the Marine Biological Association of the United Kingdom 70:173-18pp. Riemann, F. 1989. Gelatinous phytoplankton detritus aggregates on the Atlantic deep-sea bed. Marine Biology 100: 533-539pp. Sibuet, M., Lambert, C.E., Chesselet, R., et al. ; 1989. Density of the Major Size Groups of Benthic Fauna and Trophic Input in Deep Basins of the Atlantic Ocean. Journal of Marine Research 47: 851-867pp. Walker, M., Tyler, P.A., Billett, D.S.M. ; 1987. Organic and Calorific Content of the Body Tissues of Deep-Sea Elaspodid Holothurians in the North East Atlantic Ocean. Marine Biology 96: 277-282pp. Gage, J.D., Billett, D.S.M. ; 1986. The Family Myriotrochidae Theel (Echinodermata, Holothurioidea) in the Deep Northeast Atlantic Ocean. Zoological Journal of the Linnean Society 88:229-276pp. Gooday, A.J., 1986. Meiofaunal foraminiferans from the bathyal Porcupine Seabight (northeast Atlantic): size structure, standing stock, taxonomic composition, species diversity and vertical distribution in the sediment. Deep Sea Research A. 33 1345-1355, 1357-1373pp. Lampitt, R.S., Billett, D.S.M., Rice, A.L. ; 1986. Biomass of the invertebrate megabenthos from 500 to 4100 m in the northeast Atlantic Ocean. Marine Biology 93, 69-81pp. Battersby, N.S., Malcolm, S.J., Brown, C.M., Stanley, S.O. ; 1985. Sulphate reduction in oxic and sub-oxic North-East Atlantic sediments. FEMS Microbiology Letters 31: 225-228pp. Billett, D.S.M., Hansen, B., Huggett, Q.J. ; 1985. Pelagic Holothurioidea (Echinodermata) of the northeast Atlantic. Echinodermata: Proceedings of the 5th International Echinoderms Conference, Galway. Balkema, Rotterdam 399-411pp. Lampitt R.S. ; 1985. Evidence for the seasonal deposition of detritus to the deep-sea floor and its subsequent resuspension. Deep-Sea Research, 32, 885-897pp. Pfannkuche, O.; 1985. The deep-sea meiofauna of the Porcupine Seabight and abyssal plain (NE Atlantic): Population structure, distribution, standing stocks. Oceanologica acta 8: 343-353pp. Sibuet, M.; 1985. Quantitative distribution of echinoderms (Holothuroidea, Asteroidea, Ophiouroidea, Echinoidea) in relation to organic matter in the sediment, in deep sea basins of the Atlantic Ocean. Echinodermata. Proceedings of the fifth international echinoderm conference Galway 24–29 September 1984, Galway, Ireland, Balkema, Rotterdam, Boston, pp. 99–108pp. Billett, D.S.M., Lampitt, R.S., Rice, A.L., Mantoura, R.F.C. ; 1983. Seasonal sedimentation of phytoplankton to the deep-sea benthos. Nature 302, 520-522pp. Billett, D.S.M., Hansen, B.; 1982. Abyssal aggregations of Kolga hyalina Danielsen and Koren (Echinodermata: Holothurioidea) in the northeast Atlantic Ocean: a preliminary report. Deep-Sea Research 29, 799-818pp. Megson, J.; 1982. The Nature of the Boundary between Southern Rockall Trough and Porcupine Abyssal-Plain. Geophys J Roy Astr S 69 (1): 286-286pp. Bouchet, P., Warén, A.; 1980. Revision of the north-east Atlantic bathyal and abyssal Turridae (Mollusca, Gastropoda). Journal of Molluscan Studies 8(suppl. ): 1–119pp. Khripounoff, A., Sibuet, M.; 1980. La nutrition d’échinodermes abyssaux. I. Alimentation des holothuries. Marine Biology 60, 17-26pp. Hansen, B.; 1975. Systematics and biology of the deep-sea holothurians. 1. Elasipoda. Galathea Report 13, 1-262pp. Outputs include non-peer reviewed articles and policy reports. Adornato, L., et al. (2010) In Situ Nutrient Sensors for Ocean Observing Systems. In: Proceedings of OceanObs ’09: Sustained Ocean Observations and Information for Society (Vol. 2), Venice, Italy, 21–25 September 2009, Hall, J., D.E. Harrison and D. Stammer (eds. ), ESA Publication WPP-306. Favali, P., and EMSO Partnership (2010) EMSO: European Multidisciplinary Seafloor Observatory European Geophysical Union General Assembly. Geophysical Research Abstracts 12:12622. Lampitt, R.S., K.E. Larkin and the EuroSITES Consortium (2010) The EuroSITES network: Integrating and enhancing fixed-point open ocean observatories around Europe. European Geophysical Union General Assembly, Geophysical Research Abstracts, 12. Bagley, P., L. Hastie, S. Osterhus, H. Ruhl, R. Lampitt, K. Larkin, V. Lykousis, M. Priede and L. Coppola (2009) Report on the Current and future potential to link with industry. EU Seventh Framework Project EuroSITES, 10pp. Hastie, L., et al. (2009) Seafloor observatories in Europe. EU Seventh Framework Project EuroSITES. Larkin, K., et al. (2010) Benthic Biology Time-series in the Deep Sea: Indicators of Change. In: Proceedings of OceanObs’ 09: Sustained Ocean Observations and Information for Society (Vol. 2), Venice, Italy, 21–25 September 2009, Hall, J., D.E. Harrison and D. Stammer (eds. ), ESA Publication WPP-306. Ruhl, H.A. (2009) Oceanographic observing systems. NOCS thematic project document for circulation to potential industrial partners. Ruhl, H.A. (2009) Climate change in the deep sea. DeepSETS Meeting (MarBEF Programme), Gent, Belgium. (Invited presentation). Ruhl, H.A. (2009) Ocean observatories, GEOSS Workshop XXVII – Understanding the Integrated Ocean Observation System, Including Sub-surface Sensors, Bremen, Germany. (Invited presentation). Ruhl H.A., et al. (2009) Societal need for improved understanding of climate change, anthropogenic impacts, and geohazrd warning drive development of ocean observatories in European Seas. EU Sixth Framework Project ESONET NoE contract No. 036851, 80pp. Ruhl, H.A., L. Géli, Y. Auffret and J. Grienert (2009) Science Modules of the European Seas Observatory NETwork (ESONET). EU Sixth Framework Project contract no. 036851. 38pp. Ruhl, H.A., L. Geli, A. Colaço, J. Karstensen and R.S. Lampitt (2008) Science Objectives and Design of the European Seas Observatory NETwork (ESONET). EU Sixth Framework Project contract No. 036851, 38pp. Ruhl, H.A. (2008) Ocean observatories. CAREX Technology and Infrastructures Workshop, Sant Feliu de Guixols, Spain (Invited presentation). Ramirez Llodra, E. and D.S.M. Billett (2006) Deep-sea ecosystems: pristine biodiversity reservoir and technological challenges. In: The Exploration of marine biodiversity: scientific and technological challenges, Bilbao, Spain, Fundacion BBVA, 63–92, Duarte, C.M. (ed.). Burkill, P.H. (2006) Pelagic biogeochemistry of the PAP Site. RRS Discovery Cruise 306. Southampton, National Oceanography Centre, Southampton, 92pp. Billett, D.S.M. (2000) RRS Challenger cruise 142, 19 April–19 May 1999. Temporal and spatial variability of benthic communities on the Porcupine Abyssal Plain and in the Porcupine Seabight. Southampton Oceanography Centre Cruise Report 30, 63pp. Sibuet, M. (1999) RRS Discovery Cruise 237, 25 Septemper–08 October 1998. BENGAL: high resolution temporal and spatial study of the benthic biology and geochemistry of a north-eastern Atlantic abyssal locality. Southampton Oceanography Centre Cruise Report 23, 38pp. Billett, D.S.M. (1998) RRS Challenger Cruise 135, 15–30 Oct 1997. BENGAL: High resolution temporal and spatial study of the BENthic biology and Geochemistry of a north-eastern Atlantic abyssal Locality. Southampton, UK, Southampton Oceanography Centre Cruise Report 19, 49pp. Rice, A.L. (1996) RRS Discovery Cruise 222, Leg 2, 29 August–24 Sep 1996. BENGAL: high resolution temporal and spatial study of the benthic biology and geochemistry of the north-eastern Atlantic abyssal locality. Southampton Oceanography Centre Cruise Report 4, 86pp. Lampitt, R.S. (1993) Sediment trap material and sediment trap analyses of particulates. Note: (5pp. figs Appendix) in, NERC Biogeochemical Ocean Flux Study Community Research Project 1987–1993: final reports of Special Topic Awards, Volume 2. Plymouth Marine Laboratory. Various pagination (in 2 vols). Griffiths, G., M.C. Hartman and S.G. Alderson (1992) Shipboard ADCP observations during RRS Charles Darwin cruise 51. Institute of oceanographic Sciences Deacon Laboratory Report 223, 97pp. Lampitt, R.S. (1988) Particle flux at abyssal sites in the North Atlantic. pp171–178 in: Sediment trap studies in the Nordic countries 1, Helsinki: Yliopistopaino. 205pp. P. Wassmann and A.-S. Heiskanen (eds.). Lampitt, R.S. (1985) Seasonality on the deep sea floor. NERC News journal, 3(6):9–10. Lampitt, R.S. (1984) The use of in situ photography in studies of the deep-sea benthos at I.O.S. Wormley, Surrey. Institute of Oceanographic Sciences, Report No. 182, 39pp. Billett, D.S.M. (1983) Seasonal sedimentation of phytoplankton to the deep sea benthos. Deep Sea Newsletter, 7:9–10. Lampitt, R.S. (1980) The influence of a sea bed structure (Bathysnap) on near bottom currents. Institute of Oceanographic Sciences, Internal Document No. 110.